The Port Townsend Marine Science Center released a report April 11 following the one-day Puget Sound Citizen Science Summit 2018 at IslandWood Retreat on Bainbridge Island, Wash., January 26. 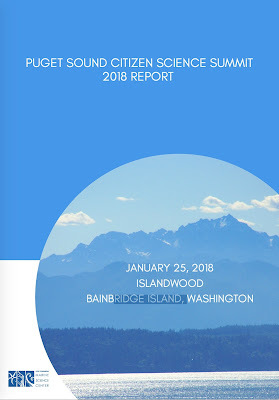 Attended by 55 participants representing 13 educational institutions and programs, 13 local, state and federal government agencies and 15 environmental organizations, the goal of the summit was to advance the citizen science community-of-practice dedicated to Puget Sound recovery and conservation. Reliable data, the stock-in-trade of science, is paramount. Consistent methods, the bedrock for reliable data, require conformity in project applications, sites and time. To ensure robust data management, a coherent system with clarity of ownership and accessibility is fundamental. Communication is crucial, from dialog in recruiting and training volunteers to keeping them in the loop when reporting results. While citizen science is cost effective, it requires equipment and coordination by paid staff and has ongoing overhead costs which are most frequently funded through transitory, short-term grants. The summit was funded in part by a grant from the Satterberg Foundation and organized by the PTMSC with support from numerous organizations, including the University of Washington’s Coastal Observation and Seabird Survey Team, the Northwest Straits Commission, the U.S. Geological Survey, Washington Sea Grant and the Washington State University Extension. The Puget Sound Citizen Science Summit 2018 Report, including proposed next steps, can be downloaded here. The PTMSC is celebrating the nation’s annual Citizen Science Day on Saturday, April 14 with special activities at its Natural History Exhibit and Marine Exhibit at Fort Worden State Park. Visitors can take part in a BioBlitz and tour the redesigned marine exhibit, featuring a new conservation lab. For details, click here. For the latest information about the Port Townsend Marine Science Center, visit www.ptmsc.org and www.facebook.com/PortTownsendMarineScienceCenter. Also, look for #PTMSC or @PTMarineScience on Twitter and Instagram.